$20 Admission includes access to M Pool and Daydream. Local ladies receive free admission before Noon, local men receive 50% off admission before Noon. Valid local ID required at check-in to receive offer. Reserve your VIP cabana or daybed online or by calling 702-797-1808. DayDream hosts will reserve exclusive seating for you in one of our cabanas, daybeds or stage-side couch sets. 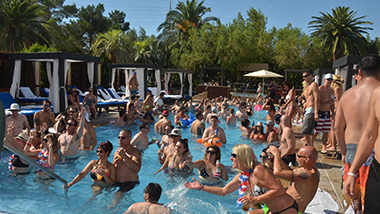 From DJs and daytime parties to night swims, concerts and movies, you'll find live, poolside entertainment you can enjoy with friends on DayDream pool club's calendar of upcoming events. Enjoy appetizers, sandwiches, salads, pizzas, platters for large parties and more. 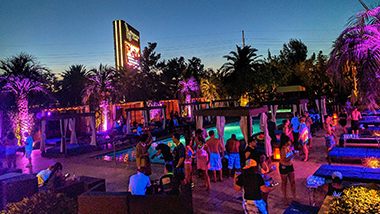 Choose from bottle service, VIP packages, hand-crafted cocktails, beer and nonalcoholic drinks – all deliverable directly to your cabana or day bed. M Pool & Daydream are excited to offer an Exclusive All-Access Season Pass, which can be purchased at the M Pool check-in counter. Pricing begins at $129 for a limited number of passes- don't miss out on a season of fun at a discounted price! Unlimited entries to M Pool & DayDream for a Passholder and a Guest. 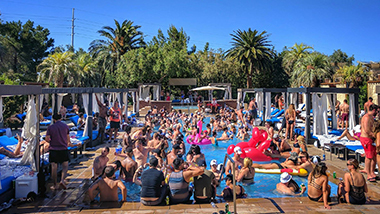 DayDream offers the hottest pool parties with live, poolside entertainment, and the best ways to cool down during the hot summer months in Las Vegas. See photos from our recent events here. Want to see more? See even more photos on our Facebook and Instagram pages, share them with your friends and post comments. DayDream's 12,000-plus-square-foot, adults-only oasis at M Resort in Las Vegas features lush landscaping, a unique ice-railed bar, an infinity-edge pool, and newly upgraded VIP amenities. Every Saturday and Sunday, DJs mix today's hottest hits and remixes poolside at DayDream. Try your luck in a revolutionary gaming environment. Our open-air casino is filled with light and offers slots, video poker, Pai Gow Poker, craps, roulette and more. From classic burgers, pastry and all-you-can-eat-sushi to an award-winning steakhouse and buffet, you'll find plenty to fill your hunger at M Resort. Complete your experience with a stay at our luxurious hotel. Enjoy spacious rooms with marble floors, automatic lighting controls and amazing views.